Every city has its skeletons, and Portland, Oregon–the one-time shanghai capital of the world–is no exception. This summer, The History Press is delighted to represent the seamier side of the Rose City in Finn J. D. John’s Wicked Portland: The Wild and Lusty Underworld of a Frontier Seaport Town. As Doug Kenck-Crispin asserts in the foreword, if you’re “on the lookout for a riveting, stimulating and, indeed, slightly ribald tale” you’ve come to the right place. In its youth, Portland, Oregon, combined rough-and-ready logging camp with gritty, hard-punching deep-water port. Lusty lads dallied with hard-eyed beauties in dark alleys, and crimps and captains bartered in blood money for the drunk and drugged. From the seedy waterfront to the notorious North End, Portland’s sin sector offered vices packaged in pint glasses and perfumed corsets. Establishments like Nancy Boggs’s floating bordello and city police chief James Lappeus’ Oro Fino Saloon beckoned to the city’s wastrels and grifters, votes could be bought for the price of a pint and Bunco Kelly’s Mariner’s Rest fronted a shanghai operation. Join Finn J.D. John of the “Offbeat Oregon” column as he reveals the roughest, most colorful era of Portland history, when the Rose City developed an international reputation for violence and lawlessness. 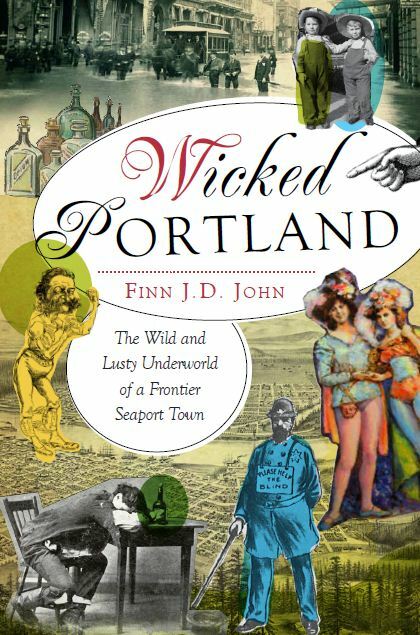 Wicked Portland: The Wild and Lusty Underworld of a Frontier Seaport Town by Finn J. D. John is available from The History Press and Portland bookstores. I would like to point out that this book is one of the first to use QR codes, printed at the front of each chapter, to access multi-media content designed for smartphones. The idea is, you read it with your iPhone or Android in one hand, and as you go through each chapter, you’ve got zoomable color versions of the photos on your phone, plus bonus bits like embedded videos, links to relevant Web articles and podcasts, and a Facebook-driven comment section. Each chapter has two pages — one for phones and one for wide-screen devices like computers. The Web site is still a work in progress, but you are most welcome to check it out any time. It’s at http://wicked-portland.com (the wide-screen version) or http://ofor.us/wpdx (the mobile-size page). Finn has gone to great lengths to provide the Wicked Portland reader with a dynamic experience that goes beyond the page. The press is very excited to try something adventurous with the inclusion of QR codes, and we look forward to the audience response!